This product requires the base game Borderlands 2. Take Borderlands 2 to the next level. The Ultimate Vault Hunter’s Upgrade lets you get the most out of the Borderlands 2 experience. This pack includes level increases up to level 61. Play through the game again with access to new weapons, gear and more. 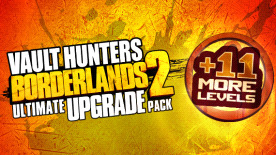 The Ultimate Pack is part of the Borderlands 2 Season Pass, now offering even more value for the price! If you own the Borderlands 2 Pass, DO NOT purchase this content here as you will be charged again. Borderlands 2 required; sold separately. Borderlands 2 is required to play this DLC.